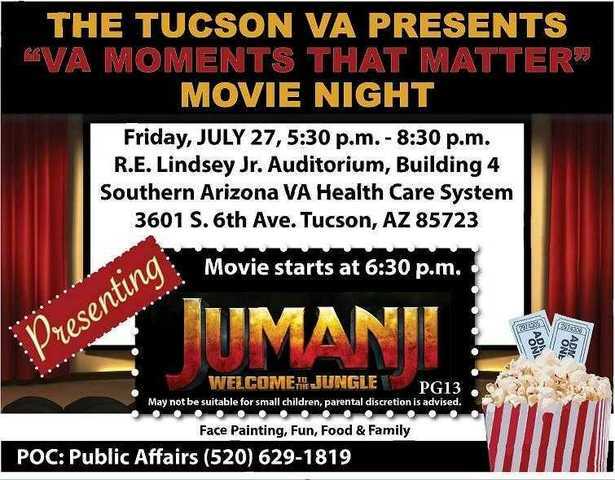 If you're looking for something to do, the Tucson VA will soon present their very first VA Moments that Matter movie night. On Friday, July 27 they'll be showing the "Jumanji: Welcome to the Jungle." It's also a chance to meet other veterans, employees, and community members, but the best part is that it's totally free. Kids are invited, too. There's going to be face painters on hand to give the young ones a little pizazz. All of the entertainment will be going on from 5:30 - 8:30 p.m. at the Southern Arizona VA Health Care System on 3601 S. 6th Ave.